Gazania (Gazania spp. ), also known as African daisy, is a colorful flower from South Africa that grows as a low groundcover. It is known for its ease of growing and long bloom period which lasts from early summer until the first frost. Gazania grows as a perennial in USDA zones 9 to 11, but is commonly grown as an annual in colder zones. It is one of the most widely available flowers in nurseries throughout the country. Gazania has two to four inch round blossoms with many petals that radiate from a button-like center reminiscent of a daisy. The flowers come in a range of colors though they are primarily found in warm tones. The finely cut foliage can be either green or silvery, depending on the variety. The foliage of gazania plants hugs the ground with the flowers rising on short stalks just above it. The overall height of the plants rarely reaches more than 16 inches. 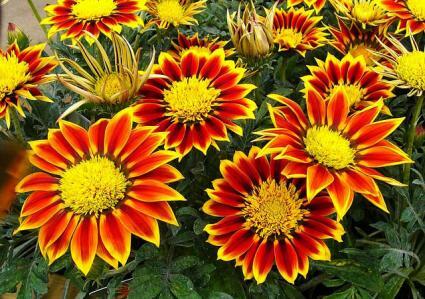 Gazania is noted for its tolerance of dry, sandy soil and intense heat. Full sun and well-drained soil is its primary requirement, but it performs best in hot, dry conditions. Cool, damp weather often leads to disease. In climates where gazania grows as a perennial it makes a very trim and tidy groundcover over areas large and small, forming a dense mat of foliage that out competes weeds effectively. It grows well on slopes and is an excellent choice for rock gardens or to cascade gracefully over a retaining wall. Gazania is also useful as a low border to frame beds of taller annuals or perennials. Grown as an annual, gazania is effective in hanging baskets where the foliage will cascade over the edge. It is also useful in small pots on decks and patios and can even be used indoors for a short term splash of color. 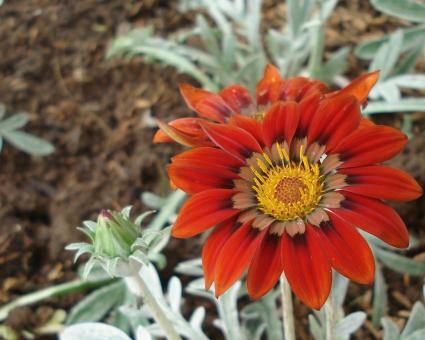 Gazania varieties vary according to size and the color of flowers and leaves. It is typically available in mixes. The 'Daybreak' mix is known for its large blossoms (four inches) and yellow centers with dark rings around them. 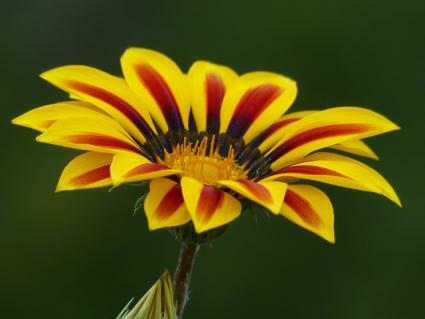 The 'Mini-Star' mix is smaller in stature than other gazanias (six to eight inches tall) and comes in shade of red, orange, white, pink, and yellow. The 'Talent' mix is known for its silvery foliage and comes in shades of pink, yellow, white, and orange. 'Red Stripe' is a unique cultivar with yellow petals that have a red stripe down the center. 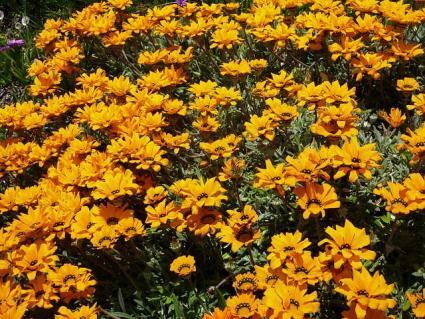 To grow as a groundcover or as border, plant small plugs of gazania every six to 12 inches. These can be found as flats in the groundcover section at nurseries. It will fill in to form a dense mat of vegetation within several months. For potted plants, it is more desirable to start with a full size (one gallon) transplant. Gazania requires very little care. Fertilizer is unnecessary and may results in fewer blossoms. Gazania needs regular irrigation to get established, but afterwards only when there has been several weeks of hot weather with no rain. Otherwise, there is little to do other than remove the spent flowers periodically to maintain a neat appearance. Gazania is highly resistant to pests and disease. Powdery mildew, bacterial leaf spot, and crown rot can all occur, though they are generally a sign that the location is too damp to grow gazania effectively. If these diseases occur, the best defense is to remove the plants and try to find a more suitable location, rather than spraying with pesticides. Gazanias brings a warm cheery feeling to the garden and attracts loads of butterflies. It has such a sunny disposition that the flowers close each night only to reopen at dawn the following day.